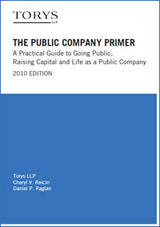 Torys is pleased to announce the release of The Public Company Primer: A Practical Guide to Going Public, Raising Capital and Life as a Public Company. Published and distributed globally by RR Donnelley, this 350-page guide is co-authored by Cheryl Reicin and others. Cheryl V. Reicin is a partner and head of the Technology and Life Sciences Practice Groups in the New York and Toronto offices. To view the entire guide in PDF format, click here.